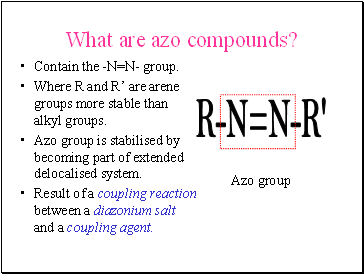 Where R and R’ are arene groups more stable than alkyl groups. Azo group is stabilised by becoming part of extended delocalised system. Result of a coupling reaction between a diazonium salt and a coupling agent. Only stable salts are aromatic - not particularly stable. Electron rich benzene ring stabilises the -N+N group but decomposition occurs above about 5oC. Add cold soln. 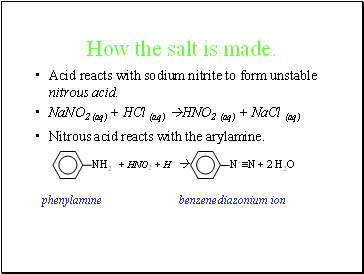 sodium nitrite (NaNO2) to arylamine soln. In dilute acid below 5oC. Prepare fresh and use immediately. How the salt is made. Acid reacts with sodium nitrite to form unstable nitrous acid. Nitrous acid reacts with the arylamine. A diazonium salt reacts with another compound containing a benzene ring called a coupling agent. 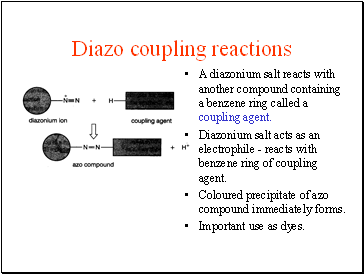 Diazonium salt acts as an electrophile - reacts with benzene ring of coupling agent. Coloured precipitate of azo compound immediately forms. 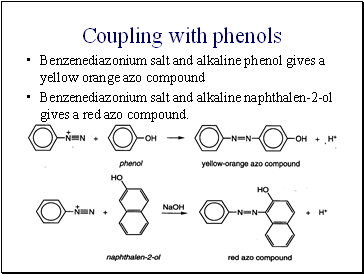 Benzenediazonium salt and alkaline naphthalen-2-ol gives a red azo compound. 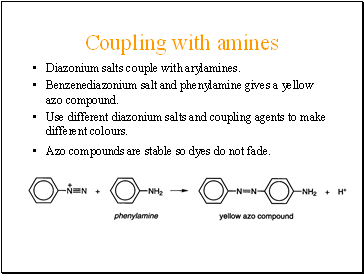 Diazonium salts couple with arylamines. Benzenediazonium salt and phenylamine gives a yellow azo compound. 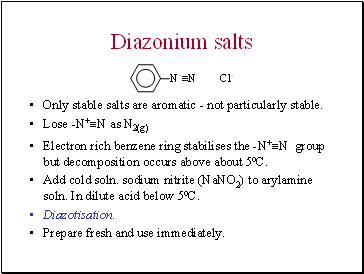 Use different diazonium salts and coupling agents to make different colours. 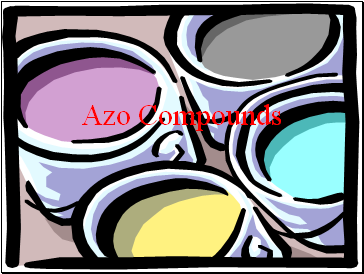 Azo compounds are stable so dyes do not fade.